(Vancouver, BC) – Canadians looking for information on how to get involved in wheelchair sports can now do so from the comfort of their own home thanks to the new Bridging the Gap website, which launched today at www.btgcanada.ca. “The next generation of wheelchair athletes is online, so that’s where we need to be,” said Bridging the Gap National Coordinator Duncan Campbell. 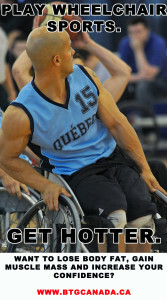 Bridging the Gap is Canada’s leading nationwide first-contact wheelchair sports program. Since its launch in 1997, the program has introduced thousands of people with disabilities to wheelchair sports via Have a Go Days, multi-sport programs in rehabilitation centers, wheelchair loans, peer mentorship and sport development clinics. All people with physical disabilities are welcome. Campbell hopes that the new website will give people with disabilities the information they need to begin reaping the benefits of physical activity. Bridging the Gap’s website was created by Pleasant Design and was supported by Coloplast Canada. To visit the website, please visit www.btgcanada.ca.